Vancouver, BC who creates art and concept designs for Movies, TV, games and comics. His career started as a concept designer at BioWare nearly twenty years ago. Fourteen games later he moved to the movie industry (2008) where he has worked on Eureka, Once Upon a Time, The Flash, V and Supergirl to name a few. John still finds time to make fan art for the practice and the sheer fun of it. For that alone, I could just hug the man but I also found all these fabulous images in his galleries of Falcon, Storm, Luke Cage, Black Panther, Deathlok and Bishop. John agreed to chat with me about those characters, their movie appearances and Marvel design and art in general. John, I’m in love with your energetic art style and vibrant colors and I couldn’t pick a favorite from your galleries if you gave me a month to choose. 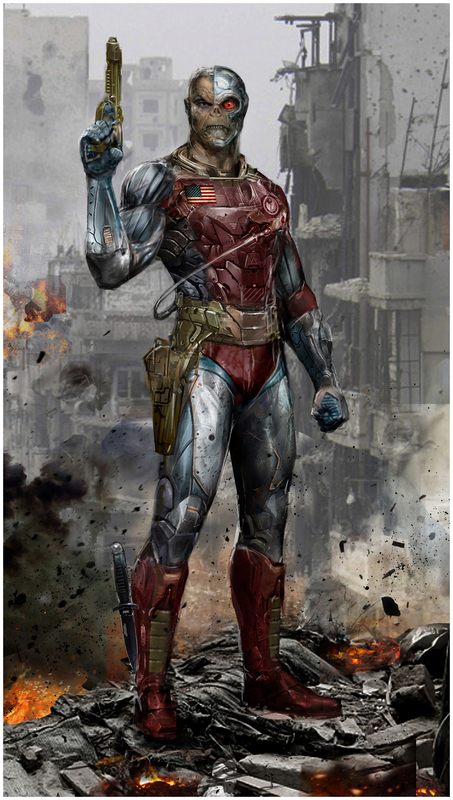 But since it’s Black History Month and I adore Falcon let’s start with your beautiful fan art piece of him! All of these images received a loving retouch by John so I’m adding a link for each to their original in his gallery: Falcon. 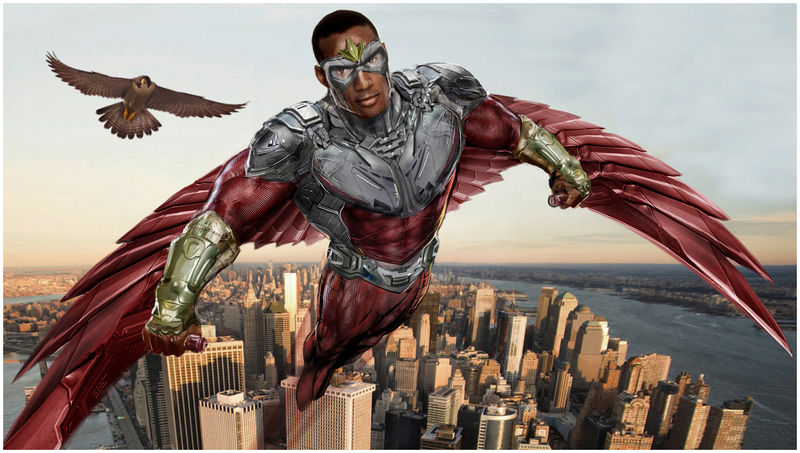 Your version of Sam Wilson aka the Falcon is inspired by his classic Marvel iteration with Redwing as a real bird and the red, gold and silver costume and star headpiece. But you portrayed him with Henry Simmons‘ likeness. Was that before Anthony Mackie played him in the MCU or was that your personal preference to play the role? This was a fortuitous dovetail. It was prior to Simmons being cast in SHIELD and after Mackie was established in the MCU. I think Mackie is outstanding as Sam and a great presence and my rendering hopefully enhances and embraces the mythology of the character. I really like Simmons’ naturally heroic classic superhero look, it suits well and thought for a blue-sky dreamcast, cast the net wide. Given the wonderful and entirely practical grounded bones in the core MCU costume design even flights of fancy should have anchors, from costume details to recognizable actors if it works. And for my illustrations I’m prone to shoehorning my own choices but in this case it’s an embarrassment of riches. Anthony is crushing the role and in an alternate universe I think Simmons would be stellar as a retro classic. No one loses there! Which Red Wing do you prefer in hindsight, the live one or the mechanical? Splitting the difference I enjoy them both by their own virtues. I was raised on the live raptor but always appreciate a smart upgrade. And which version of Falcon? The MCU or the classic comic book version? As a creative challenge, the classic version but as a practical integrated world building version, MCU. Again they both satisfy different spheres of my aesthetic promiscuity. As we talked about, Henry Simmons is already holding down a Marvel Cinematic Universe role as Mack in Marvel’s Agents of S.H.I.E.L.D. Have you watched the show? If so what do you think of it? Sinful admission: I have both Agents of S.H.I.E.L.D and Gotham lined up for binge marathons during my upcoming hiatus from The Flash and Supergirl. I’ve watched cherry-picked episodes and enjoyed it but given that they were asynchronous to the main continuity I was a bit lost. Look forward to getting up to speed. I’ve met a few of the cast at events and they’re a splendid bunch of humans. Your beautiful Storm is an homage to Alex Horley’s depiction of the African Goddess. The original very much shows the same sort of energy and motion as the majority of your works do. Is Alex Horley an artist that influences you? Horley is one of many whom I admire for a multitude of reasons. He’s madly gifted and I’m pleased to honour his influence. I unapologetically graze both history and contemporaries for inspiration, galvanizing my resolve and often, simply sheer awe and wonder at their facility, execution and pursuit of their perfection and Alex is no exception. I find I learn new tricks when I homage so I do it often. 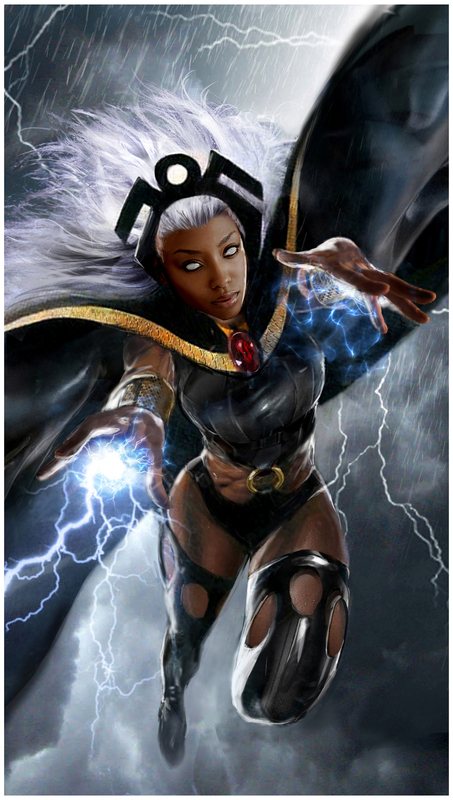 What did you think of Storm’s latest MCU appearance in XMEN – Apocalypse? As far as XMEN: Apocalypse it was a film not without a legion of shortcomings, one of which was the creative choices associated with, and under-utilization, of the Four Horsemen. Disappointing as they’re critical players in the entire Apocalypse storyline, not mute window dressing. Alexandra Shipp was absolutely on point as Ororo, gorgeous, fierce, powerful but like the majority of the cast, sadly flailed under a dreadful chloroformed script. The MCU and Marvel’s Netflix shows, in particular, seem to do away with a lot of the plumage of the classic comic book heroes. Do you consider that a loss for the comic genre as a whole or do you think comic books might emulate the movies and TV more? How much is a comic book hero/villain determined by his/her look? It’d be interesting to hear an artist’s PoV on that. I’m not sure it’s a loss so much as necessary reset evolution to keep the characters part of the pop-cult dialogue, fresh and connective. Earlier versions of popular and obscure are always available and easily accessible in our cultural archive. The Internet never forgets and neither should we. I draw a parallel to our own lives – we move forward in fashion, clothing tastes, versions of style and decoration, it would follow as dynamic, organic creations reflecting and mirroring our life and times superheroes should too. In many cases, in fact most, as popular tastes evolve and remix, costuming needs to power curve along with it. Good bones are good bones but form language rarely sits still, nor should it. Some superheroes like cars, watches or suits, stay elegant and classic and never age a day. Others are clearly of a specific era (eg. 90’s Image comics) and can always use a rethink and fresh coat of paint, or in some cases just a thoughtful re-calibration. That said, unsolicited change for no good or transparent reasons can be discouraging. 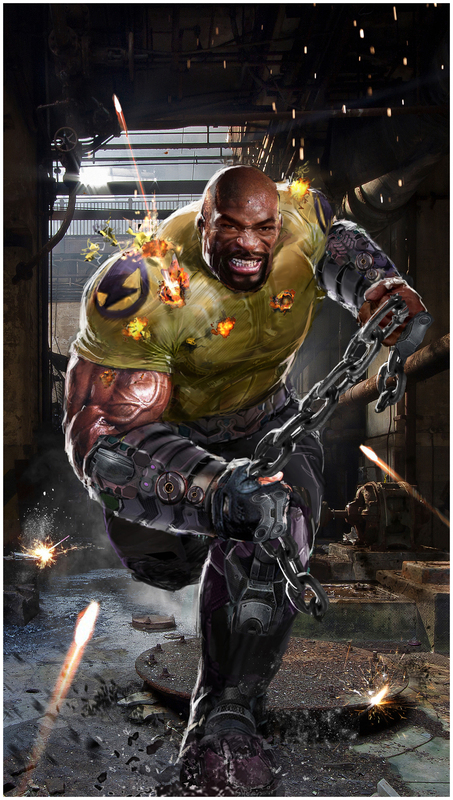 Luke Cage WiP by John Gallagher. With Luke Cage and Daredevil the lo-fi durable working class nature of their costumes suits the tone and texture of the narrative. And the MCU, along with Nolan’s Batman on a world stage, work to answer the question about superheroes working tacitly and reasonably in a real world scenario where we’re required to conditionally suspend our disbelief at the utter improbability of the concept. For villains and heroes, intent, form and silhouette are key broad strokes but not always essential to determining their moral compass in the motivational spectrum. But even that is a skirmish and not an outcome. Colours and form are not always a clear line to instant recognition as it requires more than just an understanding of fashion, material, capes and missions to help determine heroism and villainy visually. An easy example here is black was at one time reserved almost exclusively for villains. Now, clearly not. Villains should be big and wear scary spiky threatening gear. Now, clearly not. Other factors in the costume construction should speak to the character’s position, prosperity and place, which can indicate their scheme and game, in the sense of wealth and ecosystem of technological support (Iron Man being a 50 yr old billionaire genius inventor contrasted with Batgirl being a 17 year old wearing thrift store second hand gear) and where and how the character operates – intergalactic, deep space celestial, street level, magic, science and numerous other modifiers and parameters. More than anything else, it should energize the audience and give them a hint on what to expect after they make their presence known: mythic, iconic, terrifying, intimidating, inscrutable, obvious while keeping them yearning for more, and that includes the gack ‘n tack. The actual mechanics of constructing an effective costume are a dirty alchemy of balancing visually active and calm areas, material, colour and placement. Comics seem to be able to both embrace and violate all the conventions of design and still succeed, which give it a rare if not unique exemption from the academic conceits of design. For me, with that in mind, I personally love the creatively omnivorous space where there’s a freeform sharing of influences back and forth, each taking cues from the other to raise the game and elevate and inform all the various art forms without bias or prejudice. It really is exquisite kool-aid and none of those forms, in my ideal world, insist on being precious about influence or holding the line on purity. Be mongrels of art, pull from everywhere, toss it into the post-modern mixmaster and see what renders: film, comics, games, animation dgaf. 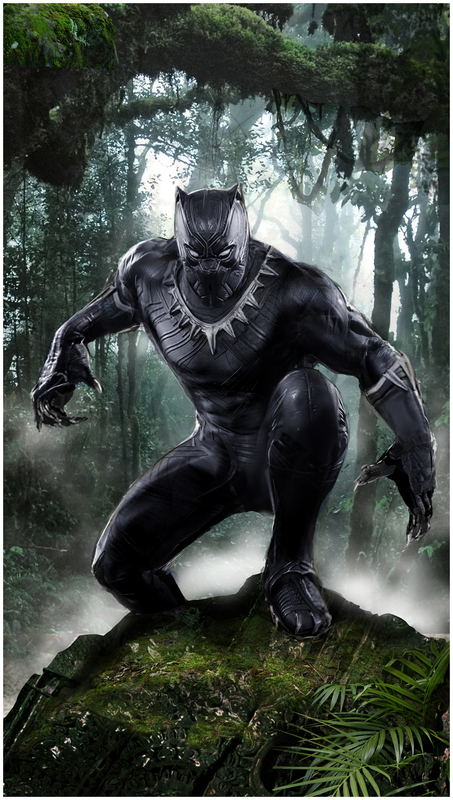 I would point out that MCU’s Black Panther (and that movie can’t come out soon enough) looks pretty close to what he does in the comics, correct? It’s superficially form accurate to Civil War. I didn’t Z-brush it so granular, microdetails are deferred but as far as capturing the essence it’s there. It seems then that any costume redesigns or complete drops aren’t solely to remove the costume aspect as a hurdle for new viewers. What are your thoughts on that? Are costumes too much to swallow for viewers who don’t read comics? I’d worry for the health of the imagination of anyone who can’t get past costumes in screen based entertainment. It’s an absolutely essential storytelling element, from Indy’s fedora and bullwhip to Batman’s utility belt. All great adventure regardless of genre or ‘powers’ have stories overabundant with key costumes and astonishing box-office returns support that assertion. If any story is presented credibly, with appropriate thought, care, design and tradecraft of the highest order, the costumes fade into positional storytelling as they tell their own tales and keynote establish the world in which these grand soap operas unfold. You simply cease to notice. But like anything that’s ill-advised or stinks of bad decisions they can jar you out of an experience. But that’s more about execution and creative guidance than the idea of costumes themselves being the problem. 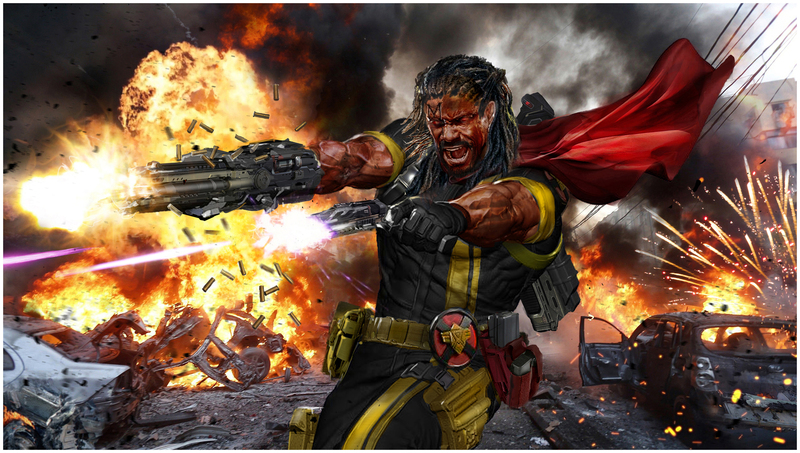 The artworks above are a portion of the black superheroes in existence. Off the top of my head, I can think of Blade, Cloak (who we’ll be seeing in the upcoming Cloak & Dagger TV show) Miles Morales, Iron Heart (Riri Williams who leads the new Iron Man title) Goliath, Misty Knight and mustn’t forget Nick Fury Jr. There are lots more but is there a black superhero or villain that you would like to see developed or an existing one you think would be smashing reinvented as a person of color? I’ve never felt like the majors haven’t embraced diversity in a meaningful way, especially recently, and wholeheartedly encourage to expand and enrich our shared culture on an ongoing basis. I have always thought a character that made perfect sense as a person of colour would be Sub-Mariner. Even as an Atlantean it always seemed his heritage was more about obedience and convenience to the time of his origin than giving it a moment’s thought about what serves a character like him best culturally, geographically and creatively. Given the proposed hypothetical location of Atlantis – for the sake of frame of conversation – he would at first pass in the discussion in my mind be of Mediterranean descent. Thank you so much, John for sharing your time and thoughts and for letting me show off some of your fan art pieces! It was a real privilege chatting with you! You can see more of John Gallagher’s art on his gallery page at devianART. This entry was posted in Comics, Fan-Artly, Interviews and tagged Agents of S.H.I.E.L.D, Alex Horley, Alexandra Shipp, Eureka, Falcon, Gotham, Marvel, Marvel Cinematic Universe, Marvel's Agents of S.H.I.E.L.D., MCU, Once Upon a Time, Storm, Supergirl, The Flash, V, XMEN - Apocalypse by MadAgs. Bookmark the permalink.